Horror, Folklore, Ghost Stories, Paranormal, Indie Writing. Spring is a season of resurrection, a season of spirits. 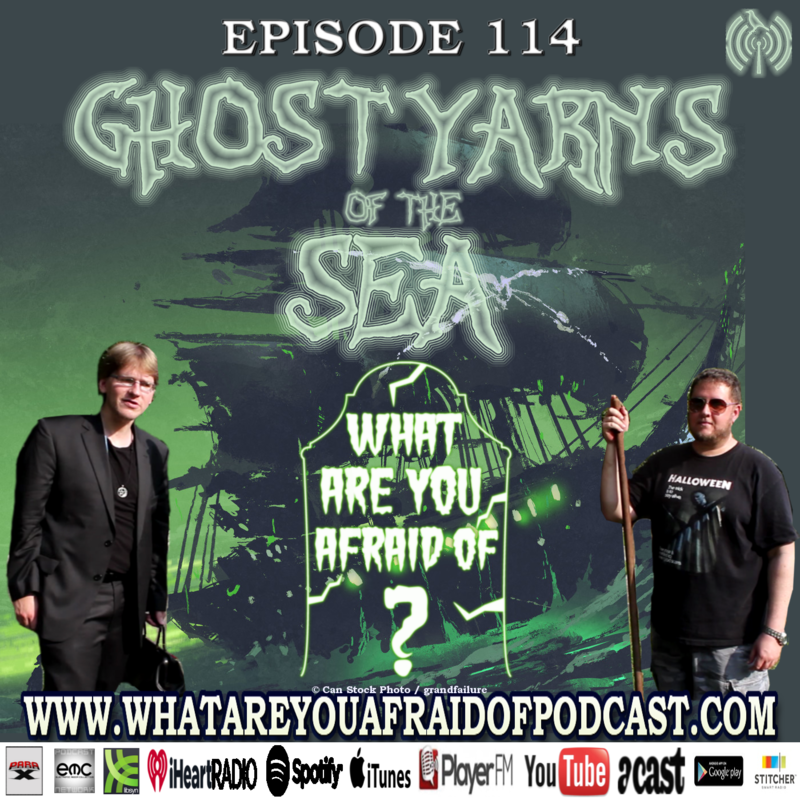 On episode 116 of What Are You Afraid Of? authors T. Fox Dunham & Phil Thomas share ghost stories, strange tales and the history of the ancient holiday of Easter—previously known as Ostara. They begin with a creepy true ghost story submitted by a show fan in Florida. The Shadow Figure tells the story of the demonic oppression of a family after they move into a new house. English folksinger David Walton narrates this tale of turning crucifixes and shadow figures. Then Fox & Phil share the history of Easter. The holiday goes all the way back to the ancient Egyptians who colored eggs to celebrate the sun’s blessing. Fox has new clown news! And he tells some more ghost stories from the Jersey Shore about another ghost ship. “Water! Please! Just one sip.” David Walton finishes the show by reading part one of a story by the author Sir Arthur Thomas Quiller-Couch: the tale of desperate men in the north called The Seventh Man. All opinions of guests and content does not reflect the opinions of T. Fox Dunham, Phil Thomas or Para-X Radio. All content is used with permission of the owners or used with a creative commons license. GLOAMY VISIONS ) by Humanfobia is licensed under a Creative Commons Attribution-NonCommercial-NoDerivatives 4.0 License. Since humans first took to the seas, stories of ghost ships haunting the waves have been told to pass the time on long voyages. 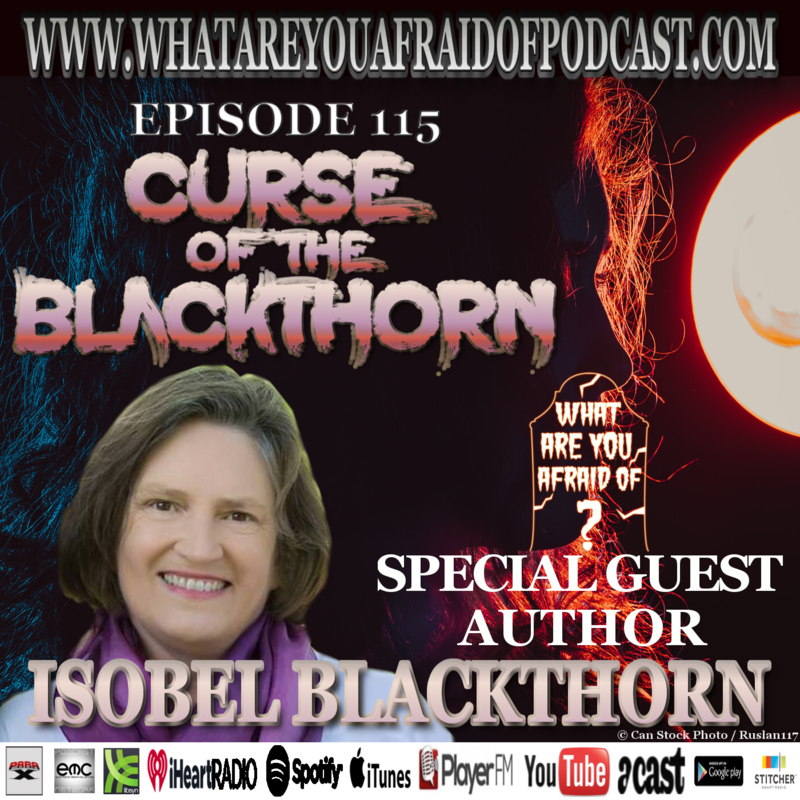 Horror authors T. Fox Dunham & Phil Thomas return on episode 114 of What Are You Afraid Of? Horror & Paranormal Show to share some of these maritime tales. English folksinger David Walton narrates a story researched and written by T. Fox Dunham about an old American cruiser docked in Philadelphia. The ghosts of dead sailors still crew the USS Olympia, grabbing visitors, manifesting in the engine room and declaring their duty to go down with the ship. These spirits continue to haunt visitors and staff from Philadelphia's Independence Seaport Museum in Penn’s Landing where the ship can be visited. They play some music from bands Handmade Moments & Rue De Prague. 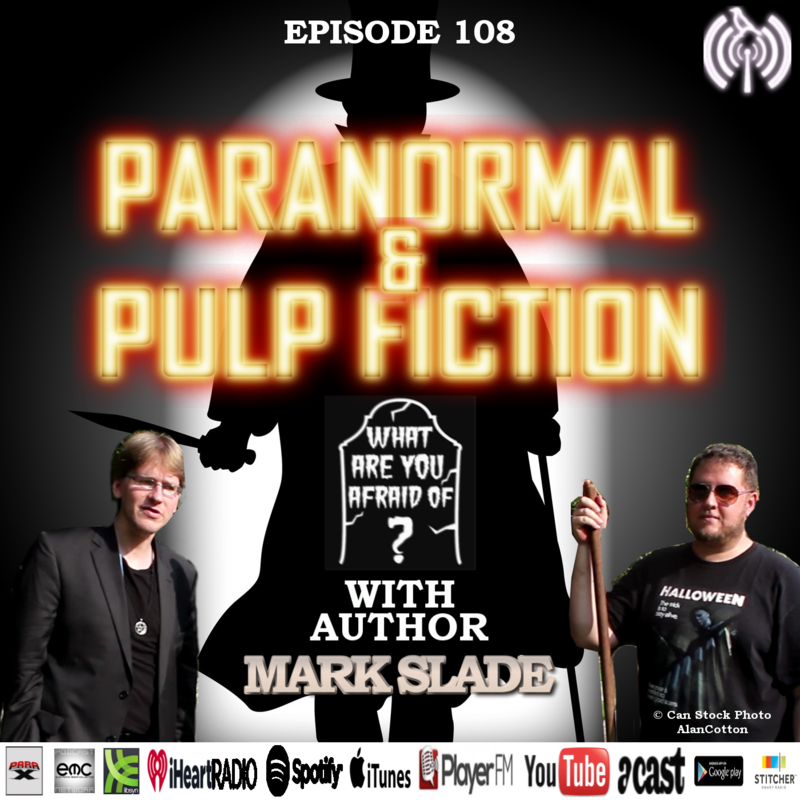 And Phil talks about the Ghost Detective, Mike Worden: a paranormal investigator and detective who gathers evidence of ghosts in the Hudson Valley, New York. The hosts finish this episode with a short horror story by Fox about a sleeping demon awoken by imperial scientists in the Victorian Age: The Future and Power of the British Empire. Stones Rolling Back Into The Ocean by Handmade Moments is licensed under a Attribution-Noncommercial-Share Alike 3.0 United States License. A Room Full of Shadows by Rue de Prague is licensed under a Attribution-NonCommercial-ShareAlike License. On episode 113 of What Are You Afraid Of? 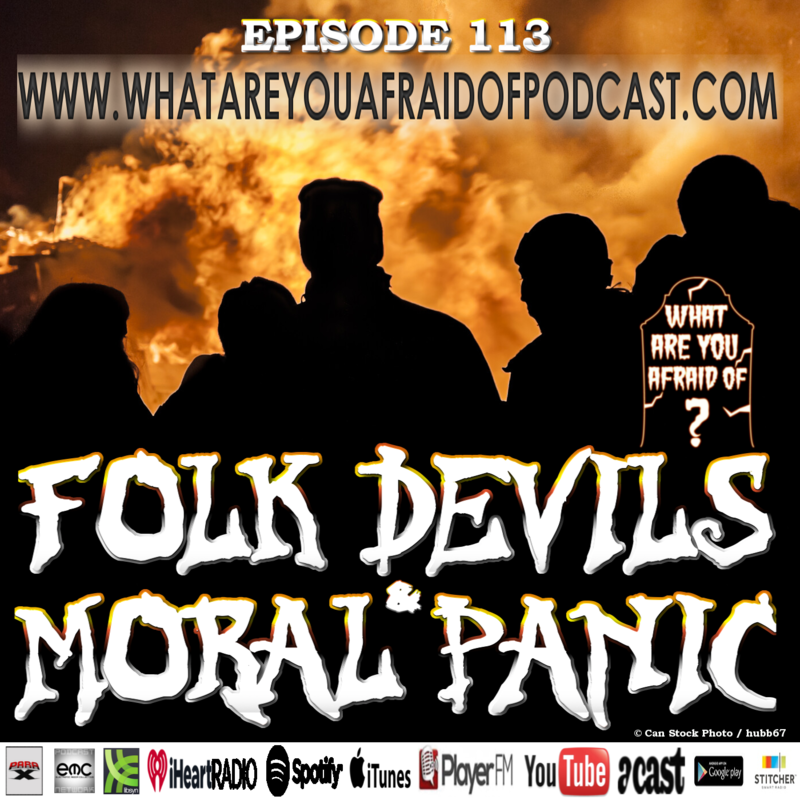 Horror & Paranormal Show, authors T. Fox Dunham & Phil Thomas discuss an old concept in folk culture called moral panic. The most recent manifestation is the Momo Challenge. Momo is a horrific bird statue that first appeared in Japan, and according to the new urban legend, she assaults children and advises them to commit acts of self-harm. Momo is the most recent folk devil—the central antagonist causing moral panic—but the phenomenon goes back to the Salem Witch Trials, even further. In particular, Fox and Phil have kept their audience updated on evil clown sightings, and they discuss other relevant trends such as the satanic panic of the 1980s, the spurious demonic nature of Dungeons & Dragons and other events in hysterical society. Fox also plays the last part in his paranormal trilogy about Philadelphia’s most notorious haunted house, The Baleroy Mansion. The final chapter tells of dark heart of the house: the blue room and the curse of an antique chair. Anyone who sits in this chair soon dies, joining the choir of agitated souls who still roam the mansion. Then the hosts finish the show talking about A Time for Violence—a new noir and horror anthology soon released by Close to the Bone with stories from T. Fox Dunham, Chris Roy, Joe R. Lansdale, Richard Chizmar, Tony Knighton, Isobel Blackthorn, John A. Russo and many more out on May 1st. Preorder on Amazon today! The band Titus 12 closes with their song from Pick Up Natty Red: A Ghost Story. Author T. Fox Dunham interviews Philadelphia noir author Tony Knighton on episode 112. Tony talks about his writing, his influences, life as a firefighter and Philadelphia as a rich setting for noir fiction. Fox plays a ghost story about a mafia boss swearing from the afterlife, and David Walton narrates Tony’s story, Boys’ Club from the new noir anthology, A Time For Violence out on May 1st. Preorder your copy now from Close to the Bone, featuring stories from the best crime and noir authors writing in 2019. 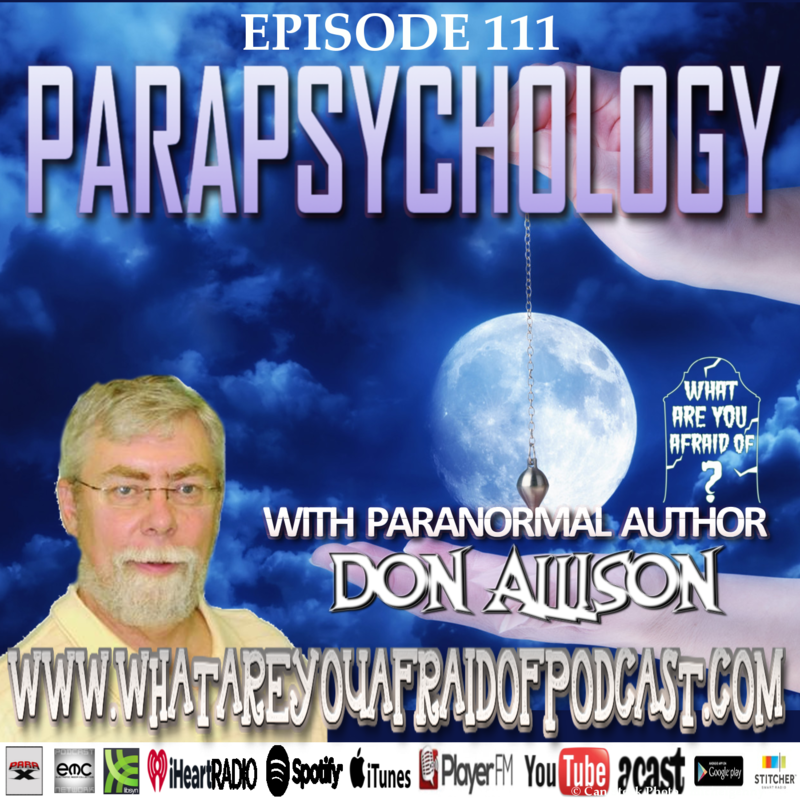 Paranormal investigator, writer and journalist Don Allison chats with horror author T. Fox Dunham about myriad techniques and devices used in the pursuit of parapsychology. Don investigated the battlefields of haunted Gettysburg with dowsing rods and a ghost box, and he shares his insights about these ancient and modern devices. 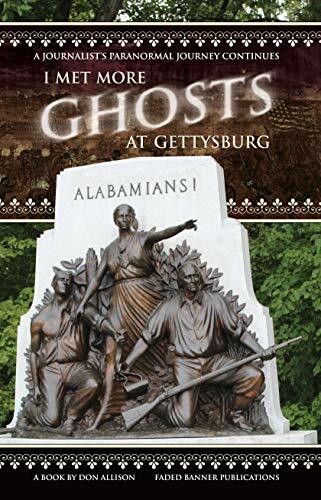 Don also tells new ghost stories from one of the spookiest battlefields from the American Civil War. 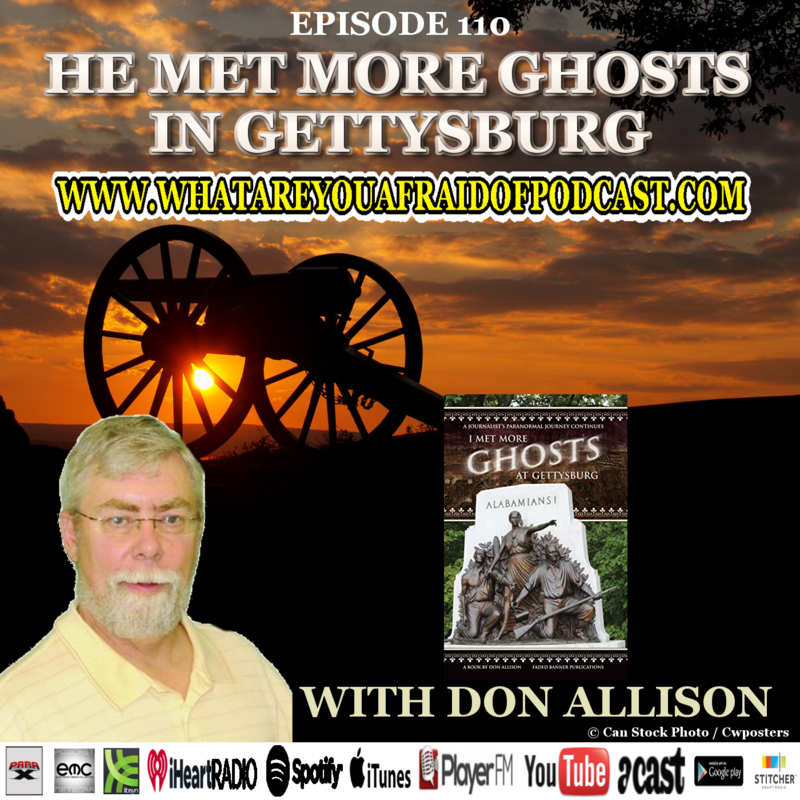 He is the author of I Met More Ghosts in Gettysburg, and English folksinger David Walton narrates another of his stories, a tale about how he contacted the spirits from different states who fought and died at Gettysburg. And to set an eerie mood, Fox plays some indie songs from singers McCafferty and Tasseomancy, and they finish the show talking about alien life in the universe and the meaning of everything. 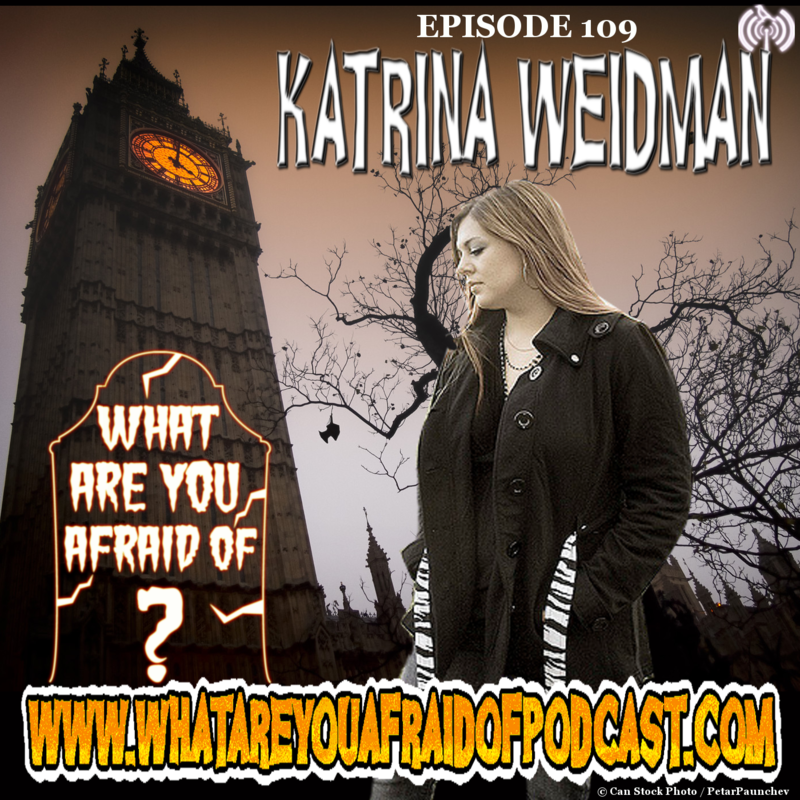 Katrina Weidman, co-host of Destination America’s Paranormal Lockdown, returns to hang out with horror author T. Fox Dunham on episode 109 of What Are You Afraid Of? Horror & Paranormal Show. Katrina is a good friend to the show, and she returns to talk about season 3 of Paranormal Lockdown. Kat shares insights about her investigations and tells the creepy tale of several paranormal encounters she had while filming at some of England’s most haunted sites including the Beattie Mansion, Shepton Mallet Prison, Cambria Jail and the Drakelow tunnels. Included in her stories is the tale of phantom knocking, shadow figures, a frightening spirit she calls “The Creeper” and the story of a condemned woman named Cassandra who was terrified of death. The season finale of Paranormal Lockdown airs this Tuesday, February 5th on Destination America. Also, because it’s Fox’s birthday on Saturday Feb 2nd, he reads an excerpt from his novel, Destroying the Tangible Illusion of Reality or Searching for Andy Kaufman, his book about life, freedom from fear, cancer, the real America and the road-trip of three strange friends as they seek out the legendary song-and-dance man, Andy Kaufman, published by Perpetual Motion Machine Publishing. Is Death the Inevitable? In the third grade, a teacher told Kat she would never amount to anything. Ha! She’s from the Bucks County area, and her life changed when she dropped off a friend at Pennsylvania State University. She then transferred to Penn State and joined the world-renowned Paranormal Research Society, training and working as their case manager. She co-hosted A&E’s hit docu-drama “Paranormal State” from 2007 to 2011, which chronicled the work of the PRS. Kat then became the host for Chiller’s “Real Fear: The Truth Behind the Movies,” which explores the real life terror behind some of the world’s most iconic horror films and hosted the follow-up special, “Real Fear: The Truth Behind More Movies.” Now she co-hosts the show Paranormal Lockdown which is playing its third season for Destination America. It’s a show that follows her and Nick Groff as they live in some notoriously haunted sites for 72 hours. Kat continues to pursue projects in music as a singer, and she writes about haunted kitchens and recipes in her blog, Haunted Kitchens. Tonight’s episode features the best ghost stories and interviews done by horror authors T. Fox Dunham & Phil Thomas in 2018. This is a great episode for current fans to enjoy or new fans to get an idea of what this dark audio magazine is about. On this show of highlights, the Philadelphia horror hosts feature ghost stories like I Met a Ghost in Gettysburg from journalist and author, Don Allison; The Suicide House, told by paranormal investigator Tina Marie Ronan; and T. Fox Dunham’s personal tale of an encounter with a ghost bus that hunts for the lost in Philadelphia. Chris Roy pens a remarkable noir story set in the south, Marsh Madness, narrated by British folksinger, David Walton. Fox interviews horror-baker Andrew Fuller, who was on Food Network’s Halloween Baking Championship, and psychic Michael Bodine, who discusses his supernatural abilities and his encounter with real vampires. Then Fox & Phil close the show with paranormal investigator Bill Reap who shares an unusual EVP that he gathered from the grave of a famous personality in children’s television. It’s been a wonderfully spooky year at What Are You Afraid Of? And the hosts are planning some compelling and scary content for the coming season. Christmas has a dark side. During the holidays in the days before television, people gathered to share food, drink, and a glowing fire, and to entertain themselves by competing through storytelling. Ghost stories won the night. Consider this. When winter came, food ran low, the cold threatened and disease killed many, often taking your loved ones. You missed them at Christmas, so the holidays used to be a mournful time. Eerie tales were popular, and if Halloween was the start of ghost story season then it peaked at Christmas. So what a perfect time for a new episode of What Are You Afraid Of? To celebrate mid-winter, horror authors T. Fox Dunham & Phil Thomas celebrate tales of monsters and the supernatural. Fox has researched several Philadelphia haunted houses and has written an account of a notoriously spooky mansion in Chestnut Hill: The Baleroy Mansion. English folksinger David Walton narrates part one of these stories about the myriad spirits who inhabit this beautiful home including a ghost boy who appears to workers and a mother who refuses to stop giving advice even from the afterlife. 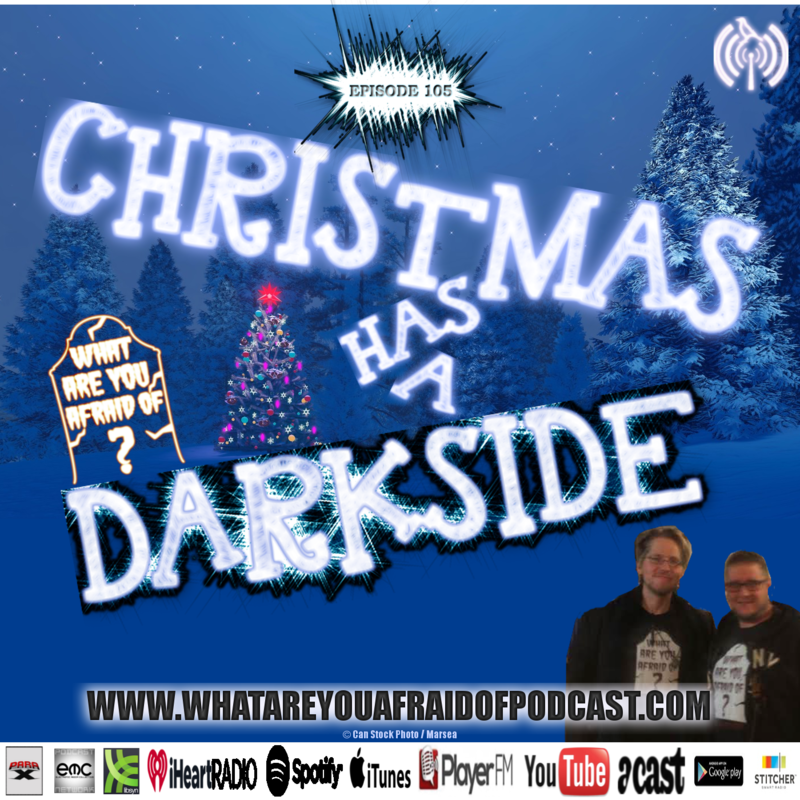 Then, the hosts talk about the many horror movies set during Christmas including the classic story of holiday mayhem, Gremlins! Little green monsters torment a small American town, and they burn most of it down on Christmas Eve. This movie is considered a Christmas classic, watched by many. They pay homage by discussing the history and trivia of Gremlins. Remember the three rules? The hosts also play some funny holiday songs including the ballad of a frustrated neighbor forced to look at a hideous blow-up Santa. Then, Fox shares some of the rich history of the mid-winter holidays from the ancient holiday of Yule to the evolution of Christmas in the United States. So, we wish you happy holidays and remind you to indulge this dark and cold season. Christmas has a dark side—or the lights wouldn’t be so bright. What Are You Afraid Of? Horror & Paranormal Show with horror authorsT. Fox Dunham and Phil Thomas. The mid-winter season has a tradition of scary stories and legends, and we’re back to share them! Fox isn’t dead! And he’s not a zombie, we swear. After a forced break while Fox dealt with pneumonia, What Are You Afraid Of? 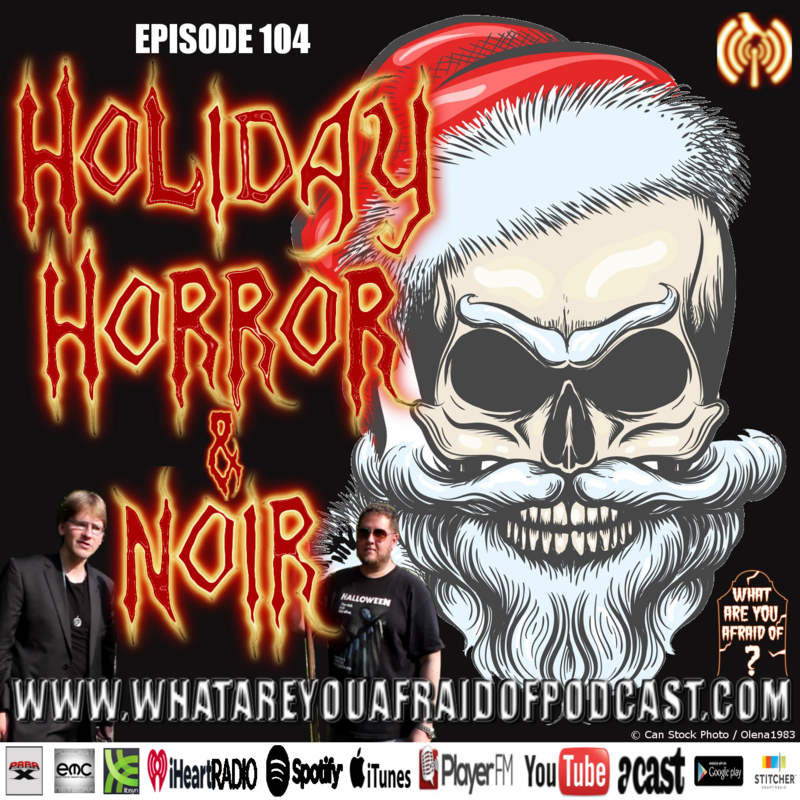 Horror & Paranormal Show returns with a holiday-themed episode, featuring ghost stories, silly tunes and noir fiction. Horror authors T. Fox Dunham & Phil Thomas catch up then discuss the dark legends and customs that evolved in Europe during the mid-winter holidays—and these are some horrible and twisted Christmas stories told to children. Don’t be naughty or else! Cannibals. Giant cats. And trolls just to name a few Yule ghouls. Fox narrates a true ghost story about the classic haunting of an old apartment building. Horror author Todd Keisling, author of The Smile Factory, shares his paranormal experiences at 146 West High Street. We play two silly holiday songs from British musician Simon Panrucker—composer for several cartoons and one of the hosts of The Past Present Future Funcast. We play his holiday carol, Leave My Nuts Alone! The show closes with a holiday noir story written by celebrated crime and horror author, Andy Rausch. Santa’s Little Helper is a sardonic tale about a burglar and a little boy who thinks he’s Santa, narrated by our amazing David Walton. Yeah. We’re terrible people! But as we learned, the mid-winter holidays have always been a time of ghost stories and dark tales, and we invite you to celebrate the creepy side of Yule with us. Or the Krampus will stick you in a sack and beat you with a stick. Winter is upon us. We jumped autumn and went right to blizzard! Nasty time to drive but great time to listen to some spooky stories while you’re stuck in the house with some hot apple cider. Horror authors T. Fox Dunham & Phil Thomas continue their quest to explore the darkness. After chatting for a bit, T. Fox Dunham shares a true ghost story about a haunted library in Easton, Pennsylvania. This library has several floors for books and a crypt for the dead. The Haunted Library was researched and written by Mark Nesbitt: Mr. Ghosts of Gettysburg himself. Then Fox shares news about a British spiritual counselor who after dating ghosts for the last twenty years has finally settled on one lucky Australian spirit to marry. How does ‘Till Death Do Us Part’ work when you’re marrying someone dead? 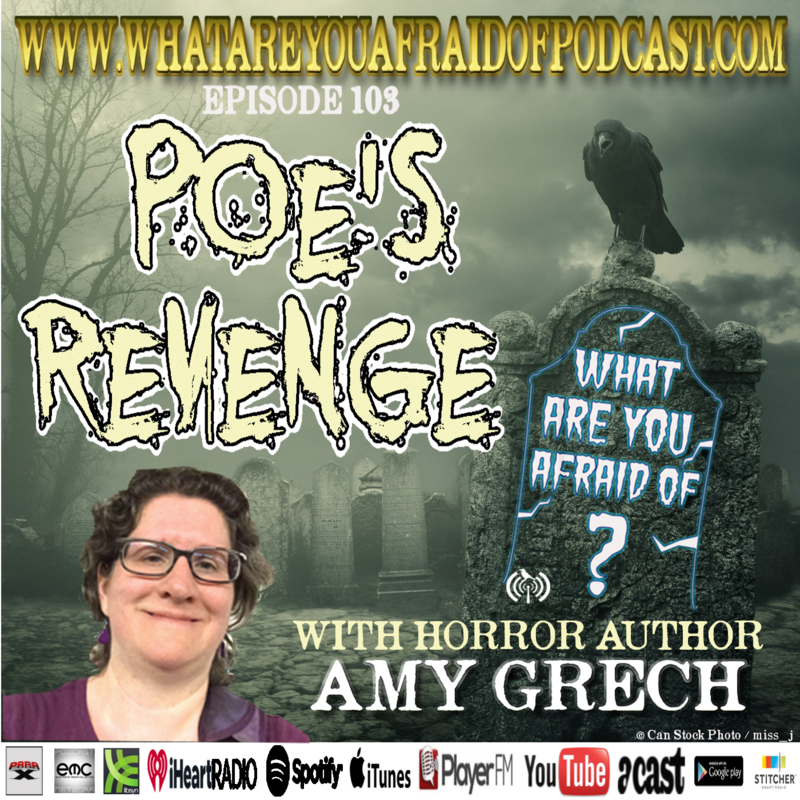 And Fox is pleased to interview female horror author and member of the Horror Writers Association, Amy Grech! She is a burning talent full of life and energy, and she talks about her work and inspiration. British folksinger David Walton narrates her ghost story, Raven’s Revenge. In this tale, neighbors hold a séance to contact the angry ghost of a murdered tenant in their building, and a phantom raven travels from the other side to reveal the murderer—a ghost story written in the spirit of Edgar Allen Poe. Thanx Amy! It’s getting dark early now, and so are we. What Are You Afraid Of? Horror & Paranormal Show. Amy Grech has sold over 100 stories to various anthologies and magazines including: A New York State of Fright, Apex Magazine, Beat to a Pulp: Hardboiled, Dead Harvest, Deadman's Tome Campfire Tales Book Two, Expiration Date, Fright Mare, Needle Magazine, Real American Horror, Shrieks and Shivers from the Horror Zine, Space and Time Magazine, Tales from The Lake Vol. 3,Thriller Magazine, and many others. 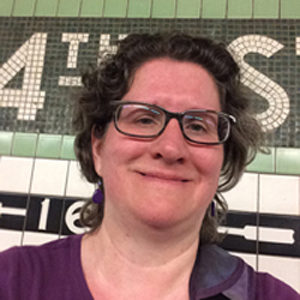 New Pulp Press published her book of noir stories, Rage and Redemption in Alphabet City. Halloween can’t happen without zombies and zombie movies! 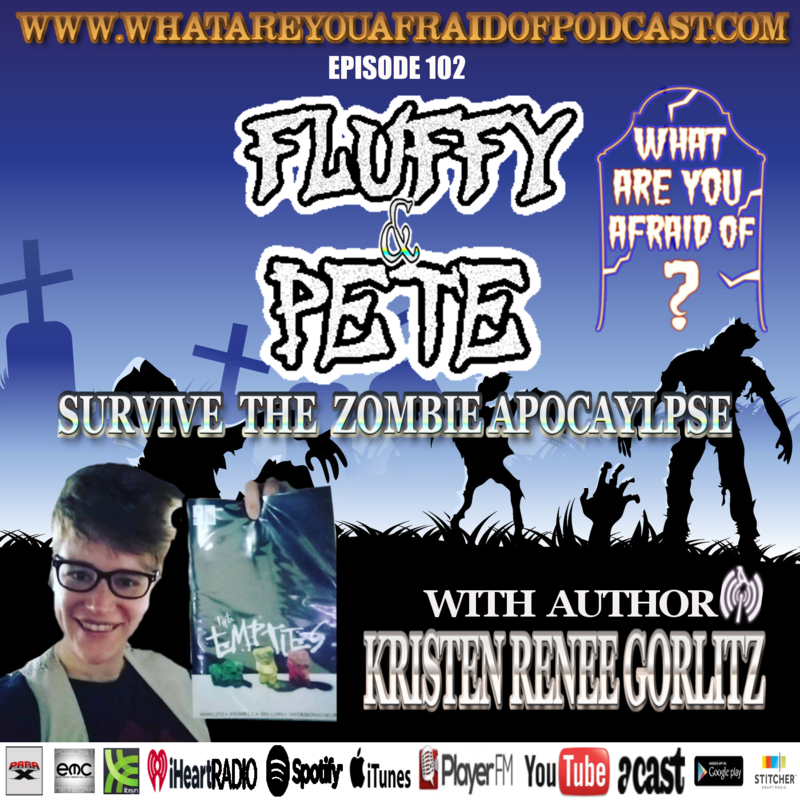 So for our 100th episode of What Are You Afraid Of? Horror & Paranormal Show, the zombies rise again. After dying due to media saturation, the re-animated strike back, returning to their rightful place in horror. 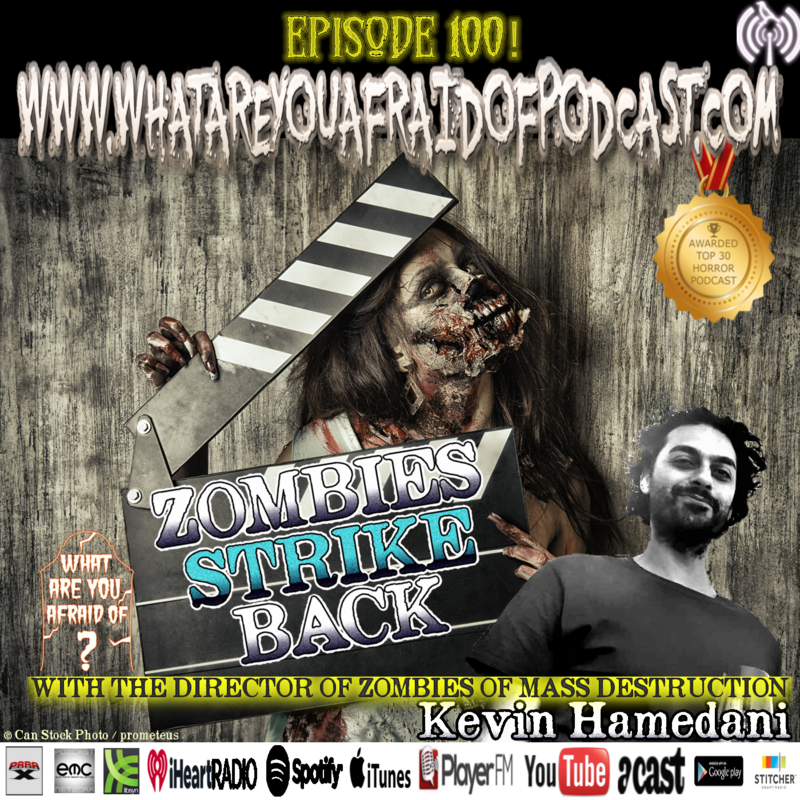 Authors T. Fox Dunham, member of the Horror Writers Association, and Phil Thomas, author and filmmaker, celebrate their beloved undead by interviewing an awesome guest, director and scriptwriter of the social satire horror film, “Zombies of Mass Destruction”, Kevin Hamedani. Born of Persian heritage, Kevin suffered prejudice in America after 9-11 and the Iraq War. In response, this brilliant filmmaker followed in the footsteps of legendary director George Romero, who created “Night of the Living Dead” as a commentary on the Vietnam War. He tells Fox and Phil about the process of filming, his career, inspirations and his love of horror movies. Kevin gives advice to new filmmakers and talks about the brief haunting of an old apartment. T. Fox Dunham also brings you a new true ghost story, “The Hungry Ghosts of Philadelphia.” The city moved the cemetery, dumping the bodies but the ghosts remained and hunger for cheesesteaks and coffee. And as a special event, T. Fox Dunham narrates one of his unpublished zombie stories set during World War II in the Pacific Theater: “The Return to Seagaia.” The war dead of Japan try to come home. To close the show, the punk group, The Zombie Dandies, play their song, “Zombie Mass Shootings”—a love song to all the great zombie films. You can’t keep a good zombie down—well not unless you aim for the head. As part of our countdown to Halloween 2018, horror authors T. Fox Dunham & Phil Thomas return to one of America’s oldest haunted sites, Fort Mifflin. 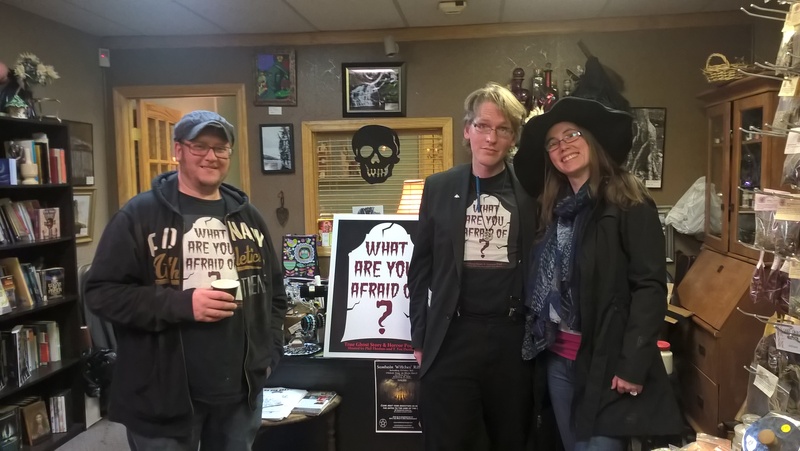 Fox organized their annual horror reading, HORROR AT THE FORT, with members of the PA Chapter of the Horror Writers Association, Nick Cato and new author, Michael Garrett, who sat in as Fox’s co-pilot for this episode. After talking about the incredible day of readings, Fox and Michael share some popular ghost stories of the Fort. Then, they hang out with paranormal investigators from R.E. A.P. 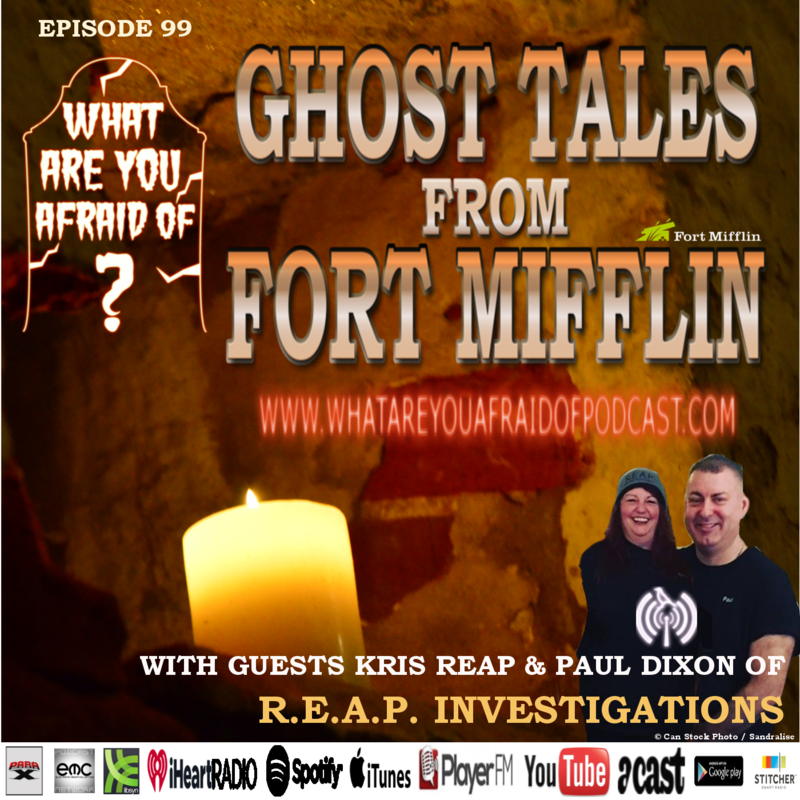 Investigations, Kris Reap & Paul Dixon, who talk about some of their ethereal encounters during the evening’s public ghost hunt, the nature of proper etiquette for paranormal investigators and the existence of demons. The spirits even follow them into the bathroom! English folksinger, David Walton, narrates two new ghost stories from the book Folklore of the New Jersey Shore by Richard J Kimmel and Karen Timper. And to get you in the mood for Halloween, they play their favorite spooky ballad from Monk Turner, “Halloween Night” and a punk song from Ed Schrader's Music Beat, “I Think I’m a Ghost.” Only three more episodes until Halloween 2018! Ghosts and monsters run wild on the island of New Jersey! As part of their countdown to Halloween 2018, horror authors T. Fox Dunham & Phil Thomas share a few stories from one of the most haunted states in the union, New Jersey. 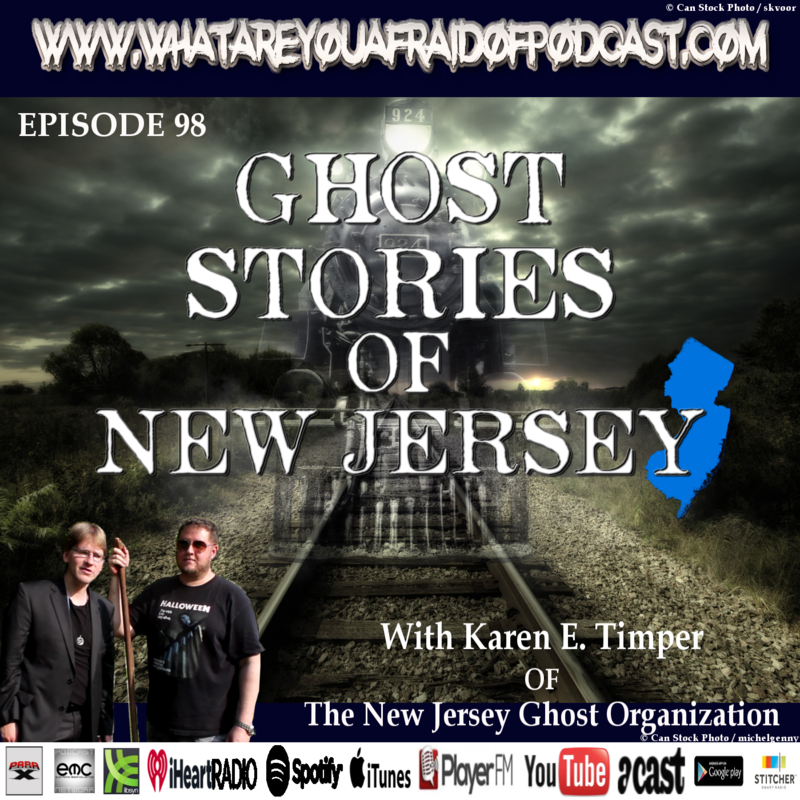 Karen Timper, founder of the New Jersey Ghost Organization and co-author of the beautiful book, Folklore of The New Jersey Shore (Schiffer Pub Ltd), comes on the show to share her insights and a few of her tales. David Walton narrates a story from the book about a ghost train that still rides the rails! Fox & Phil discuss new horror movies, video games, and T. Fox Dunham shares some of his recent paranormal encounters in Gettysburg and at Pennhurst Asylum. They finish the show with a short horror fiction written by Phil Thomas, The Darker Season—a story about a haunted ride at the Wildwood Boardwalk that burned down long ago. We’ve got your ghosts, New Jersey! Horror baker Andrew Fuller is the king of Halloween! 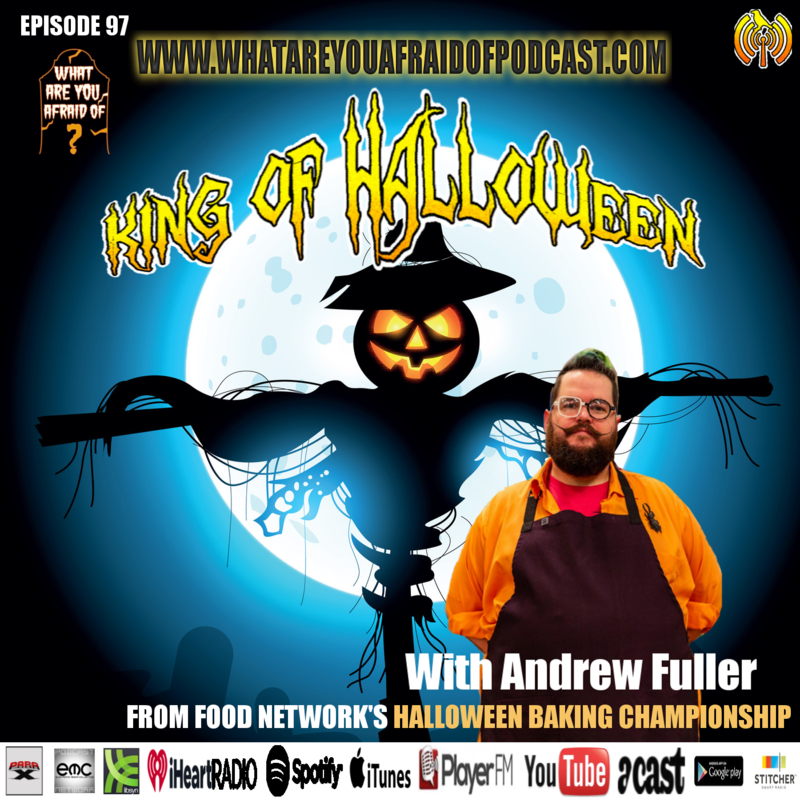 Andrew is a contestant on Food Network’s Halloween Baking Championship, season 4 and our esteemed spooky guest on Episode 97: KING OF HALLOWEEN. Horror author T. Fox Dunham and Andrew hang out during the episode, talking about his wonderful macabre baking and what it’s like to be on Halloween Baking Championship. Andrew shares his past, his motivation for baking and his great love for Halloween while sipping blood tea. The master baker shares several unique ideas for Halloween-themed baked goods our listeners can make at home. We also tell another ghost story to set the Halloween tone just right. A rebellious teen arrives late at a babysitting gig only to find her charge missing. Searching for her at a derelict home, she finds the wrong child—a dead child wearing old clothing. David Walton narrates this true ghost story, Babysitter Blues. Oh! And Andrew also hunts ghosts in his free time, when he’s not baking or on Food Network, and he and his husband have had many encounters with the other side. Andrew shares some of his ghost stories including a spooky tale about a decapitated head that appeared to him in his husband’s grandmother’s attic. And he talks about their paranormal investigation at the infamous Villisca Ax Murder House, location of the brutal murder of a family. Fox joins in with some recent ghost encounters while visiting Gettysburg with his wife this weekend and Pennhurst Asylum. Andrew is a delightful and spooky guest, and Fox adores speaking to him. Cheer Andrew on Food Network’s Halloween Baking Championship! They finish the show with a techno song about Halloween from Baltimore’s Red This Ever: I Like Halloween. So do we! We’re counting down to Halloween 2018. Psychic Michael Bodine has lived a life of adventure in the world of the supernatural. Michael grew up in a haunted house, and his mother was driven to seek help after the spirit messed with some family bibles. He discovered he was psychic at a young age, sharing his ability with his siblings. Michael takes us on a journey into the world beneath the one most people see. He explains his views on how psychics should work. “It doesn’t matter who the psychic is. It is about the message.” Oh, and he tells the story of the time he met a family of real vampires deep in a secluded woods! He’s been psychic to stars like Gary Busey and Melanie Griffith, and it’s a fascinating and hilarious show. Fox and Phil love this guy! 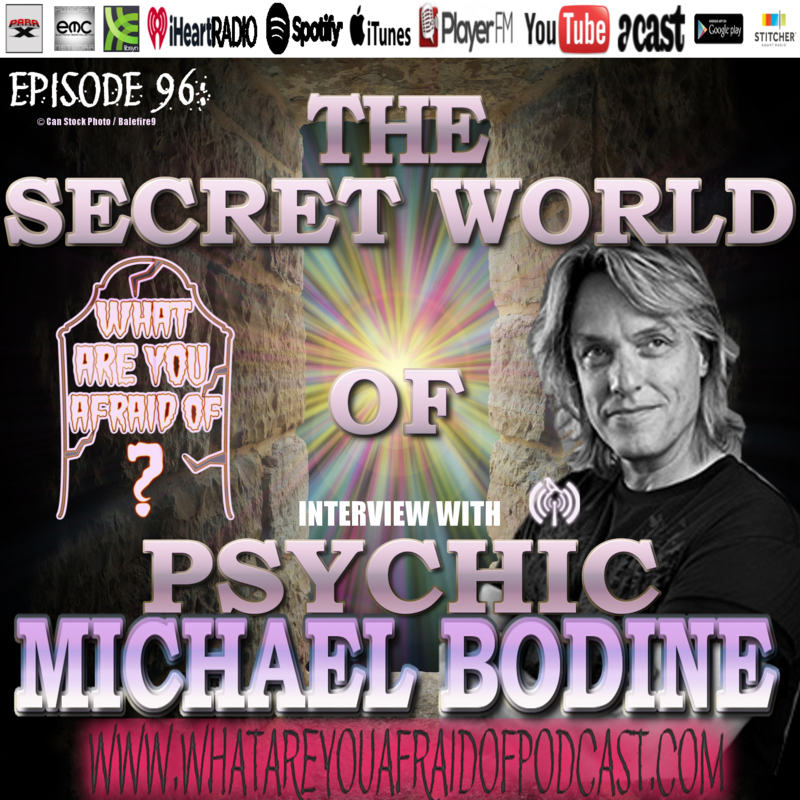 Michael Bodine on episode 96 of What Are You Afraid. Psychics. Vampires. Ghosts. Spirit guides. And Gary Busey stories--part of our countdown to Halloween 2018! New episode of What Are You Afraid Of? Horror & Paranormal Show. The start of our Countdown to Halloween 2018! Have Mercy On Our Souls. Being sick is a horror story. On episode 95, horror author T. Fox Dunham talks about his medical horror thriller, Mercy, published by Blood Bound Books. Mercy is the written metaphor of the pain treatment and violation he suffered while battling a rare lymphoma when he was 18. Horror host Phil Thomas asks Fox several new questions to provide insight into the book. FANGORIA gives MERCY 3.5 out 4 Skulls - "Dunham has channeled his many brushes with the other side into the exquisitely rendered, lyrical supernatural hospital thriller MERCY." English folksinger David Walton reads another ghost story from Exeter, UK. In the shops built over an old prison below the streets, spirits haunt the shopkeepers and phantom faces appear, crying out with laughter in Clumsy Ghosts of Exeter. He also reads an excerpt from T. Fox Dunham’s novel, Mercy. And new clown news! Take it while you can get it. Those creepy clowns are hibernating. Summer is dying, and we can feel autumn in the air. Phil’s getting his Halloween books. Fox is starting to read ghost stories. We’re planning Halloween parties. Halloween is coming! On episode 94 of What Are You Afraid Of? 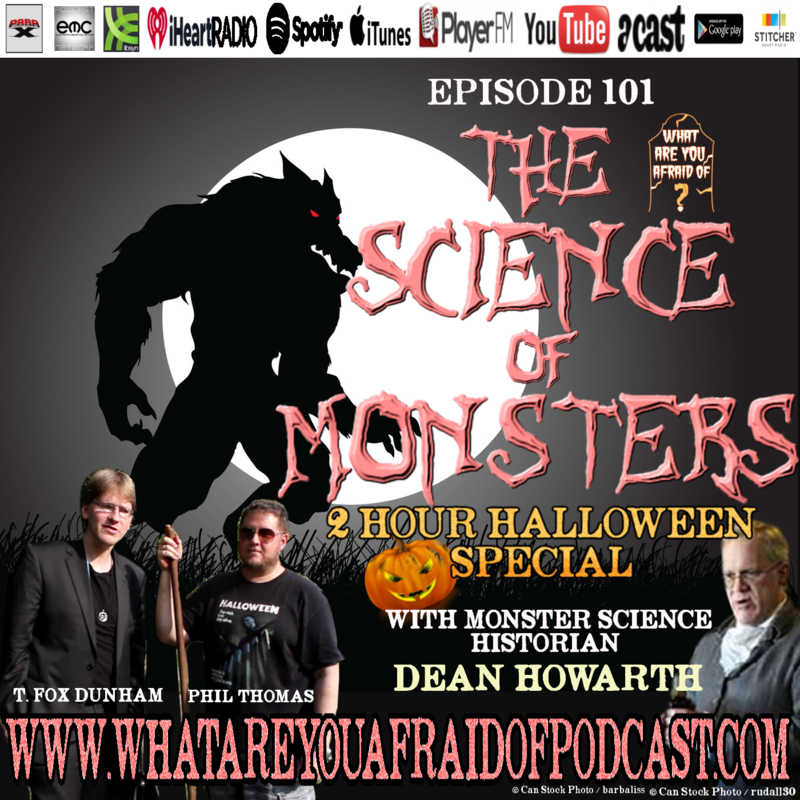 Horror & Paranormal Show, horror authors T. Fox Dunham and Phil Thomas talk about their plans for Halloween. Phil is also excited for the release of the new Halloween movie, and he talks about trivia about the original films. Horror author Kenneth W. Cain returns for part of his author’s spotlight, and we share his creepy story, Lake of Souls, read by English folksinger, David Walton. Get your boo ready for Halloween! 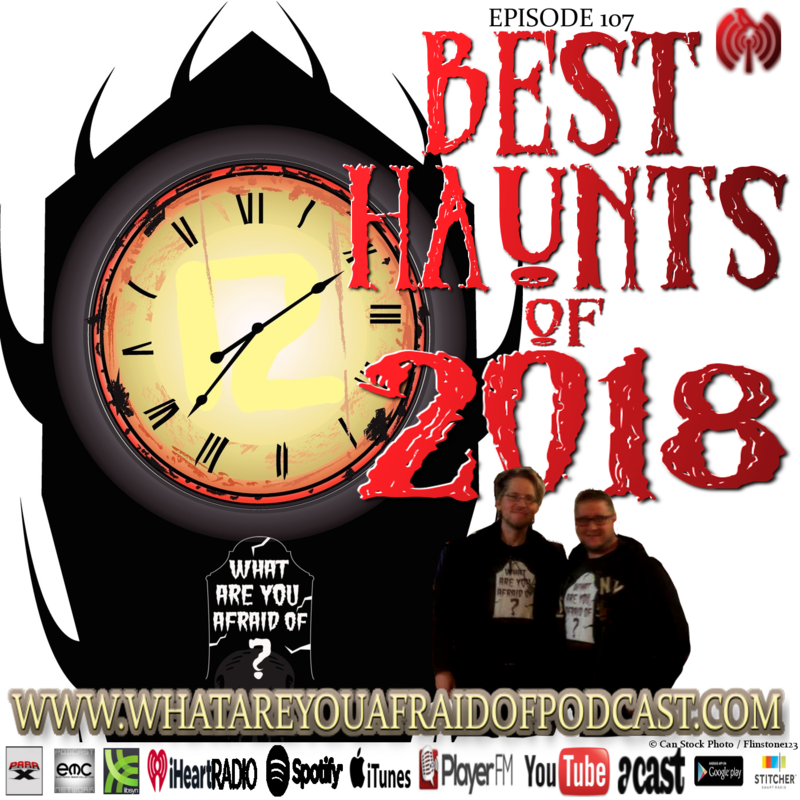 Horror authors and paranormal journalists T. Fox Dunham and Phil Thomas share their summer adventures on this episode of What Are You Afraid Of? Horror & Paranormal Show. Besides talking about the haunted history of the Hudson Valley and Jersey Shore, they discuss some true crime events such as an attempted hit in Wildwood by the Philadelphia mob. The mafia is everywhere! New ghost story too. Queen Henrietta-Marie haunts a site in Exeter, England, traumatized by the events of the English Civil War. They feature the ghost story, A Sad Queen, narrated by British folksinger, David Walton. 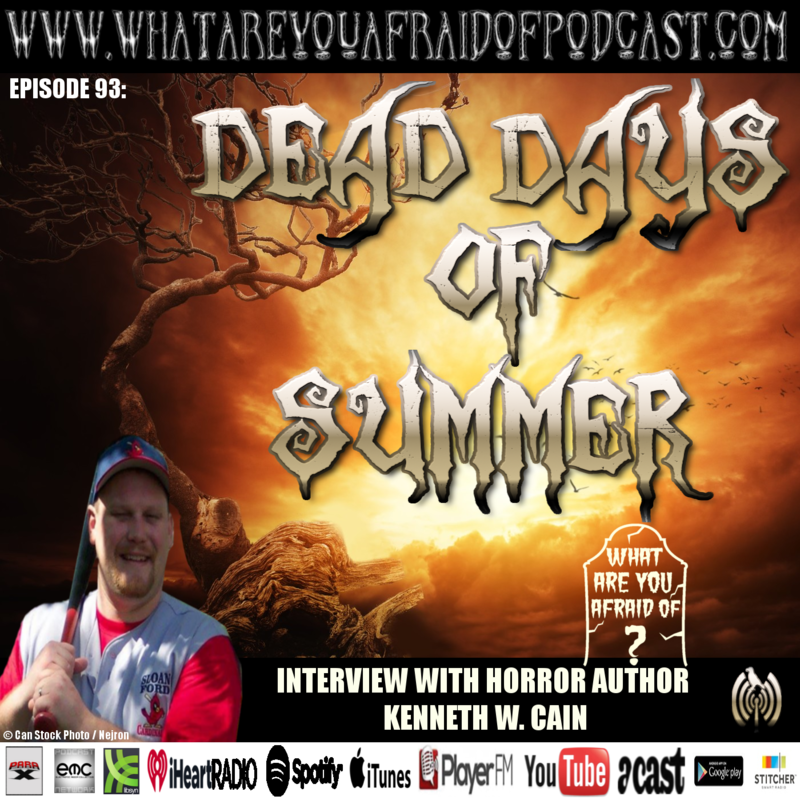 Then, Fox interviews horror author & captain of the Pennsylvania chapter of the Horror Writers Association, Kenneth W. Cain, who shares his insights on writing and working as a professional author in today’s industry. And Clown News is back! 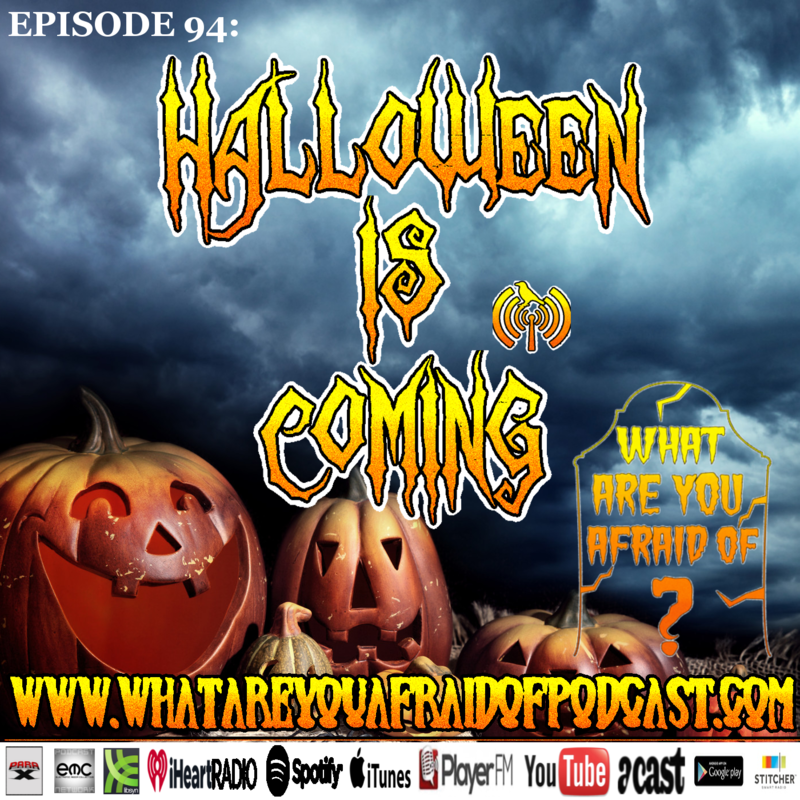 We’re enjoying the dying days of summer on episode 93 of What Are You Afraid Of? Horror & Paranormal Show and getting ready for Halloween. 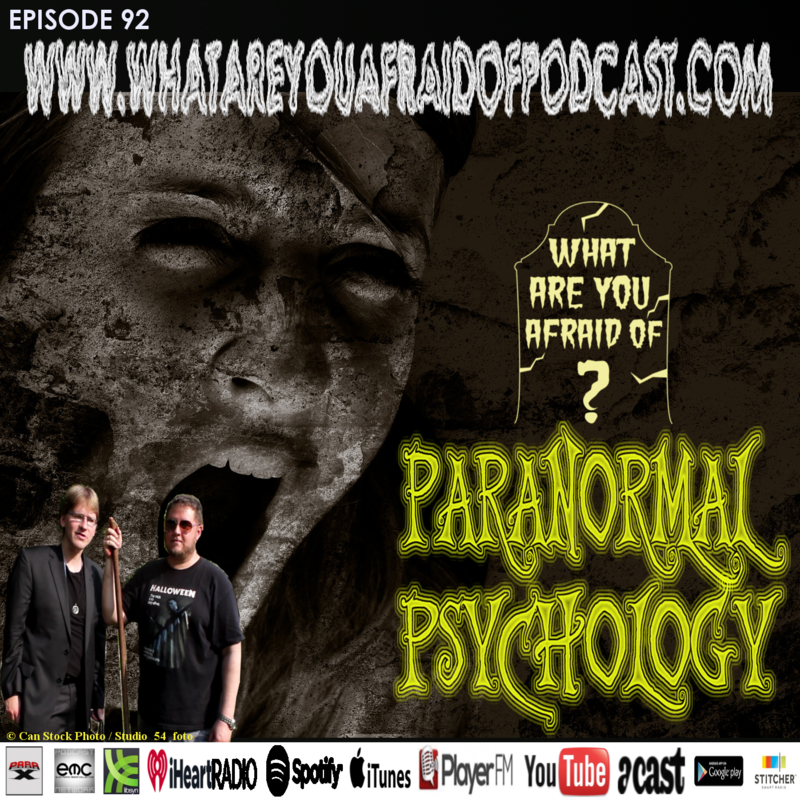 We share some ghost stories from paranormal investigator Chris Gostkowski on episode 92 of What Are You Afraid Of? Horror & Paranormal show, hosted by horror authors T. Fox Dunham & Phil Thomas. Chris is lead investigator of the Florida-based P.R.O.O.F. : The Paranormal Research Organization of Florida. In his nearly two decades of ghost hunting, Chris has encountered everything from abnormal electrical fields to a sexually hungry Succubus. Chris shares his many ghost stories while we interviewed him at the First Paranormal Expo at the Selma Mansion. He spent the night at this historic and haunted mansion, investigating the cellar with fellow ghost hunter, Paul Dixon, and they encountered a child spirit and the ghost of a Revolutionary War general. Chris talks about his perspective on paranormal investigation and talks about his work with the charity organization, Paranormal Kicks Cancer, a group that grants wishes to sick kids. ©All show material is copyrighted by T. Fox Dunham or Phil Thomas or rights owned by original authors.